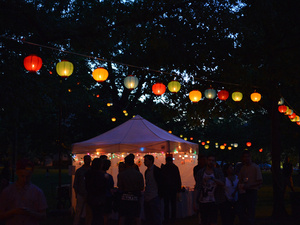 Tappan Square at its most beautiful, with hundreds of colored Japanese lanterns strung across the green. An Oberlin jazz ensemble will begin performing at 9:30 p.m. Immediately following the jazz performance, Oberlin Steel will perform on the steps of Finney Chapel in the tradition of great steel bands of Trinidad with arrangements of salsa, calypso, and jazz tunes, as well as original compositions and arrangements by band members. Rain location: Wilder Bowl, Big Top.